The Transparency Project: Part 2 – What Is the Fund Source? This is the second blog post from our Transparency Project series on the Capital Improvement Program (CIP). 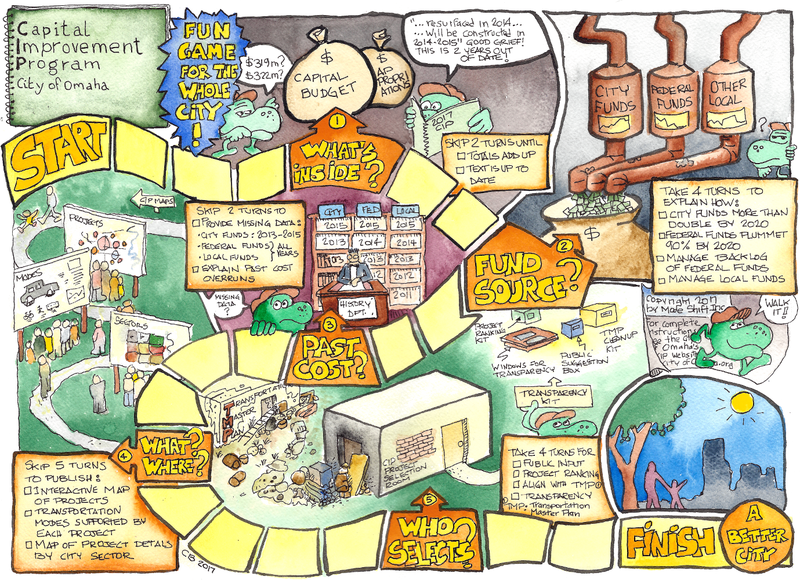 We’re following the Mode Shift CIP game board and we’ve reached step 2: A look at the CIP’s funding. We started by looking at the details inside each of the three bins shown above. Along the way, we question a surge in the use of City funds, a plunge of the federal contribution, phantom local funds, and millions of work left out of the CIP. We’re going to skip the minor sources and focus on the major ones. For those who want to know more about the minor amounts, click here. The use of Street Bonds is set to double for 2019-2022. Based on these two graphs, it is evident that the City expects to issue 2018 Street Bonds for an amount double that of the past 3 issues. Even accounting for the additional revenue from recent annexations, can the City put such a huge bond issue on the 2018 voter ballot? As shown, the federal funds are forecasted to decrease to an all-time low of $1.6 million for the years 2020-2022. This is a 90% drop from the average of the previous 11 years. The drop from the 2017 high is expected: The Bus Rapid Transit (BRT) project is receiving $21 million of federal funds in 2017 & 2018 (we’re not sure why the BRT, a Metro project is on the City CIP, but it is, and we left it in the graph). So it is strange that the City is setting its federal funds sight so low for the last years of the budget, especially when our conversations with MAPA indicate that around $10 million of federal funds per year are scheduled for Omaha on MAPA’s list, and that more is available. We understand that the City has been caught in a dysfunctional federal and state review process, which has hampered the release of federal funds, and that the City has lobbied hard to correct the problem. Nevertheless, why doesn’t the CIP show the actual federal funds scheduled for Omaha for 2020-2022? Local Funds account for 17% of the 2017-2022 Capital Budget. Some projects are required to raise local funds (see list here) and others proceed with only City funds and zero local and federal funds (such as these 30 projects). We’d like to know what criteria the City uses to decide which projects are required to have local funds–we’ll address this in blog 5 of this series. Harney Street – Market to Midtown is one of the projects required to raise local funds. It was never built because the $2.75 million of local funds don’t exist and the project’s $700,000 of City funds appear to have been re-allocated to other projects. The City can provide some transparency by categorizing Local funds as “Secured” (identified and committed) or “Future” (future funds still to be identified). Otherwise, we have no way of knowing if a project is actually scheduled to be built or if it on the list without any real funds. How is it that these two funds, which provide over $60 million a year–three times more than street bonds–are not in the CIP? Could it be that the funds are not used for street repairs? That’s unlikely. The fund description states they are restricted to street maintenance, and the budget specifically allocates them to various maintenance divisions within public works. Furthermore, the Mayor tells us that these funds are used for street repairs on her website. The street resurfacing effort of $13 million paid by “multiple sources including gas tax, vehicle registration fees, general obligation bonds and sewer revenue”. It would be clear how much effort the City puts into street resurfacing. If the reporting is combined with maps showing condition and characteristics of the City streets, it would be clear to the public why some streets get maintenance priority over others. The public would understand the relationship between lane miles and maintenance cost. What gets reported gets measured, and what gets measured gets improved. Conversely, the CIP should exclude projects or funds that are not managed by the City. The BRT project is a good example. The City has zero funds for this $25 million project, yet its budget is included in the CIP, which is a distraction and distortion of the numbers. We’ve been studying the CIP for nearly a year and contacted the City several times for clarification, so we can say without reservation that the Budget, CIP and flow of funding lacks clarity, transparency, and even some basic explanation. This is a serious issue: Citizens who understand the City’s funding process can become partners and supporters, whereas citizens who don’t understand the process are disconnected, discouraged, and quick to criticize. Will the 2018 Street Bond issue really be double when compared to the 2014 and 2010 issues? Why does the Capital Budget only include $1.6 million for its final years, when MAPA estimates $10 million for each year? What other unclaimed federal funds are available? Secured Local Funds – Funds from a specific donor, that have been identified and committed. Future Local Funds – Unidentified funds required before the project can proceed. This is the process used for Street Bonds & Future Bonds. The relationship between the City budget and the CIP should be clear. If there are reasons for discrepancies, they should be reconciled each year. We assume that the City departments are held to their budgets, so when the budgets are linked to the CIP, they will be held to the CIP as well. All street projects should be in the CIP, including the $60 million of maintenance projects. Projects that are not managed or budgeted by the City should be excluded from the CIP. We’ve talked to some dedicated and hard working City employees who assure us that the CIP is taken seriously as a guide to all City projects. Let’s hope that the City improves transparency, so that citizens can take the CIP seriously, as a guide to a better city. Keep an eye out for Part 3 where we look at past costs and what they tell us about transportation funding.